This contest is closed and the winners have been notified. Prize #1 (Zalman Fatal1ty FS-V7) goes to - ve6jhc - Folded 54 Packets in the month of May!! Prize #2 (Ideazon Merc Keyboard) goes to - BCC_tomato - Folded 2 Packets in the month of May! Bonus: If you are able to fold 10 work units in the month of May, you will receive a bonus entry in this contest. Thats it, its as simple as installing the Folding@Home software and sitting back and watching the work units pour in, all while helping a great cause. Contest Ends May 31st at 11:59PM MST. Winners will be announced shortly thereafter. Tired of listening to your screaming loud GPU cooler? 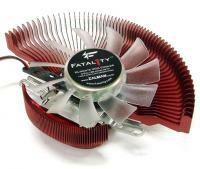 The Zalman Fatal1ty FS-V7 will take care of that, and it will lower your temps on your video card. Then since you have a cool and quiet video card you can fire up the new Folding@Home GPU client for even more folding fun. While your spare computer is folding away, your can be gaming it up with a nice new keyboard from Ideazon. The Merc Keyboard features 34 gaming keys including 3 thumb-specific layouts and 11 weapon keys surrounding a lethal central butterfly layout, which basically means your going to do more fragging. Combine that with an enhanced keyboard all-in-one and you've got a nice setup.